Roger Fry (1866-1934), Critic and painter. Sitter in 18 portraits, Artist of 5 portraits. Sir Henry Maximilian ('Max') Beerbohm (1872-1956), Writer and caricaturist. Artist associated with 28 portraits, Sitter associated with 19 portraits. A champion of Cézanne and the Post-Impressionists, Fry was an art theorist, an organiser of exhibitions and the founder of the Omega workshops (1913). A number of his most important articles were collectively published in Vision and Design (1920). 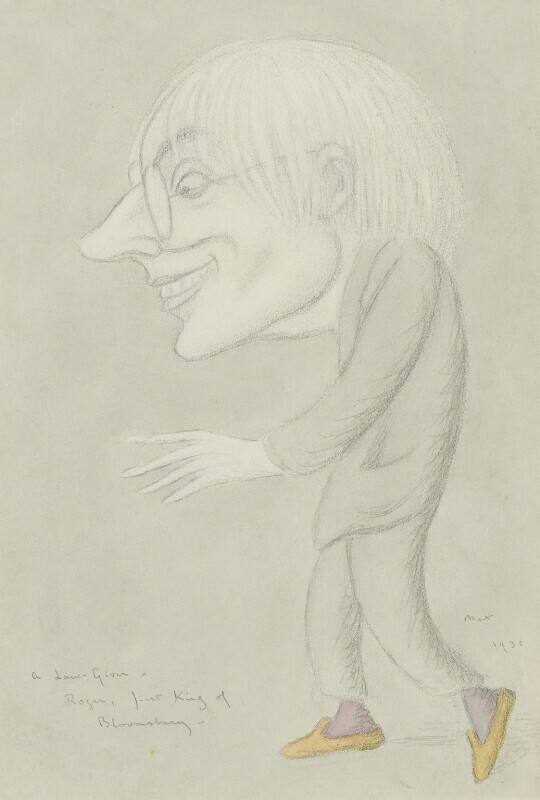 A leading member of the Bloomsbury group, this caricature by Beerbohm is inscribed 'A Law Giver - Roger, first King of Bloomsbury'. Sailors at the Invergordon naval base mutiny in response to pay cuts. The cuts of up to 25% were part of the government's attempt to deal with the Great Depression by reducing public spending. Sailors protested by holding meetings and refusing orders. Dr Harold Moody founds the League of Coloured Peoples, lobbying for equal rights for black people in Britain and for international civil rights. The modern tube map is introduced. Harry Beck's design was unique in following the properties of a circuit diagram rather than the geographical location of the stations. The Vic-Wells Ballet company is founded by Dame Ninette de Valois and housed by Lilian Baylis at Sadler's Wells Theatre. It was granted a Royal Charter in 1957 and became the Royal Ballet. The Second Spanish Republic is established. Following an election dominated by the Republicans, King Alfonso XIII abdicated and a new constitution was drawn up. The Statute of Westminster grants legislative equality to the self-governing Dominions of the British Empire. The Statue decreed that the British Government could no longer make ordinary law for the dominions unless it was at their request and with their consent.